Accessible premium water filtration for pennies a day that doesn't compromise your water's vital nutritional value. They say we do not inherit the earth from our ancestors... we borrow it from our children. The same is true for our water. Today our society spends more money adding chemicals into water than protecting it in the first place. After years of research and development, a groundbreaking approach to water filtration has arrived. Crafted from natural coconut media, Stream water filters were designed to deliver the highest quality filtration at an unbeatable price. 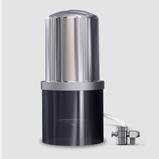 Tap into the most powerful nanofiltration system available. 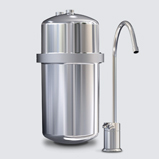 Effectively filtering over 316 contaminants for up to 750 gallons of refreshing water at only 2 cents per glass. Stream's nanofiltration systems are scientifically proven & certified to effectively filter 75 contaminants. You've never seen water so pure and convenient. Stream provides certified high quality water for less than 2 cents per serving. It's the least expensive glass of pure water ever. Just one Stream cartridge replaces 5,677 bottles of water or 7.5 faucet filters. Stream makes the best water easy, convenient, and planet friendly. As recommended by experts and the WHO, Stream leaves healthy minerals like calcium and magnesium where they should be. Stream's proven performance is achieved using natural, biodegradable coconut shells. The result is a more effective nanofiltration system. Stream's smart filter design is over 7 times larger than ordinary filters without the plastic housings that would ultimately end up in our landfills. Stream's proprietary process utilizes natural coconut shells to work on a molecular level, filtering more contaminants more effectively than any other – while leaving in the natural nutrients and minerals your body needs. Take a refreshing sip and see what makes Stream the first of its kind. It's time to come clean about the water we drink. Some municipalities still transport water in lead pipes. Lead consumption has been linked to severe health effects. Current research shows that fluoride, a chemical that is used in rat poison, does a lot more harm than good. According to a 3 year study, a total of 316 contaminants were found in the tap water supplied to 256 million Americans in 45 states. Among those contaminants, 202 were chemicals that are not subject to any government regulation or safety standards in the US. From pharmaceuticals and heavy metals, to jet fuel and microscopic bacteria, tap water in nearly every region contains a long list of contaminants. Pure, clean water has never been so fast and convenient. Simply place a Stream water filter on your countertop or under your sink. Switch between filtered and unfiltered water with the press of a button. 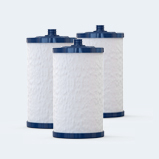 Each long-life Stream water filter cartridge filters up to 5,677 glasses of water or 750 gallons. 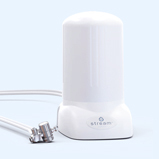 Stream's water filters are backed by a best-in-class lifetime warranty and is fully recyclable. Our policy is crystal clear. If Stream isn't the most refreshing water you've ever experienced, return it after 30 days for a full refund.